This is the third post in our series of the best devotionals. If you missed The Best Devotionals for Girls or The Best Devotionals for Boys, be sure to go back and check them out! I sometimes struggle to remember to make sure all four of my kids brush their teeth twice a day. So to say it’s a struggle to do a daily devotional is a bit of an understatement. However, I know that it is super important. I’m not sure if it’s more important than teeth brushing, but it’s right up there. Besides making sure that it is a routine, the best way that I’ve found to ensure that we do our devotional is to get a good devotional. To help you choose the best devotional for your family, here are our recommendations. 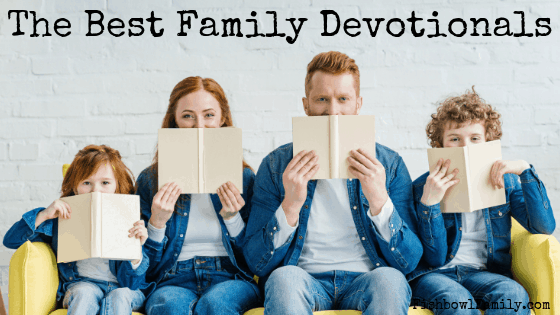 This post, The Best Family Devotionals for Your Family, contains affiliate links for your convenience. 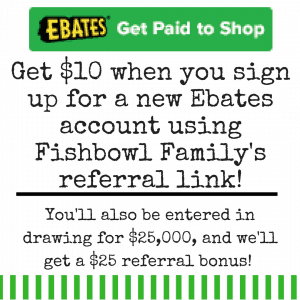 This means that if you make a purchase using our links, we will receive compensation at no additional cost to you. Read our full disclosure policy. This is one of my favorite family devotionals. In it, author Marty Machowski goes through the entire Old Testament beautifully. He uses each ten-minute devotional to point forward to Jesus and has questions that are engaging and appropriate for kids of all ages. This is a five day per week devotional so you’ve got some grace days to catch up if you miss a couple. He covers one story per week and typically includes a Psalm on the fifth day that relates to the story. You do have to have a Bible handy to do this devotional because it doesn’t include the verses in the text. For example, it will say “read Genesis 1:1-10.” I usually just use a Bible app on my phone and it’s no big deal. Or you could get a Bible to keep with your devotional to read the story together. If it’s a good day and you’ve still got some patience left, you could even let your kids read the story. This is the sequel to Long Story Short. This devotional focuses on 78 stories of the New Testament in just ten minutes per day. Again, it’s only five devotionals per week giving you some grace days if you need them. This is formatted exactly the same as Long Story Short so you will need to have a Bible handy. Each devotional starts with an engaging story or questions to get your kid’s attention. Then you read the Bible verses together (from your Bible) and have a guided discussion afterward. Each reading is only one to two paragraphs but it does a brilliant job of explaining the Bible verses in a way that kids can easily understand. The last part of the devotional time is spent answering questions. Some questions are just review to see if your kids remember the important part of the lesson and some are deeper thinking questions that give you great insight into your kid’s brains and hearts. I LOVE Marty Machowski’s writing style. He takes big theological truths and breaks them down in a way that’s easy for parents to teach kids. It’s awesome. So I’m going to just drop a couple more devotionals here that he’s written. Except for this awesome Advent devotional to do during Christmas time. This is a great devotional book because it takes advantage of a time that most families are already gathered together: dinner. So if you are a busy family (who isn’t? ), this is a great way to multitask and use every minute wisely. Each devotional is designed to be a discussion among your family and takes about 10-15 minutes. Another good thing about this book is that it can be used as a time to let your older kids practice reading or get a quick eater to have a job at the table once they’re done eating rather than just dashing off. This may not be a great devotional if your family is on the go more often than at home. I don’t know if you’re really going to want to carry a devotional to McDonald’s. However, doing a devotional in the car is great because you have a totally captive audience. Or maybe your family is more a morning family and you could do it over breakfast every day. My children seem to be part vampire and only want to be awake when the sun is down, so this is not an option for us. Another drawback is that there are 365 devotionals. This may not be a problem for you, but I can’t stand falling behind or missing days in devos like this. I’m trying to be a more flexible human, but it’s not going so great. This devotional is awesome because it is so thorough. Each devotional starts out with “Setting Up the Story” which gives some background information or some ideas to get everyone thinking about what’s coming up in the story. That is followed by a passage from the Bible and the entire text is included in the book. The scripture is followed up with questions about the passage. The questions are both review and critical thinking and are very engaging. The devotional then has closing thoughts which sum up the passage and key points from the reading and discussion. Then there are prayer prompts which give specific things to pray about and often have scriptures to pray that tie into the learning for the day. Lastly, there are two activities to do as a family that relate to the devotional. This is my favorite part of the devotional because I’m not a fun mom. I don’t think about doing crafty stuff to help emphasize the story of creation. With this devotional, I don’t have to. It’s all right there for me. The only negative thing with this devotional is that there are only 52 devotions in it. Which may actually be a positive for you, if you’re wanting to ease into devotional reading and only do one a week. Grace is a hard thing to teach. This devotional makes it easier by focusing on God’s love for us despite our unworthiness. And while this is a big concept to teach, it is also one that our kids desperately need to understand. These devotionals use fictitious stories of children making decisions (both right and wrong) to explain the focus verse. Each story is followed by questions to help your kids think through the lesson. There are only forty devotionals in the book, so again, this can be a positive or a negative depending on your devotional goals. This devotional is sort of like that because it lets you choose your own level. Each week has a Bible story, Bible verses, and a devotion to read together, three or more activities to do together, three or more discussion prompts, and a wrap-up discussion prompt. 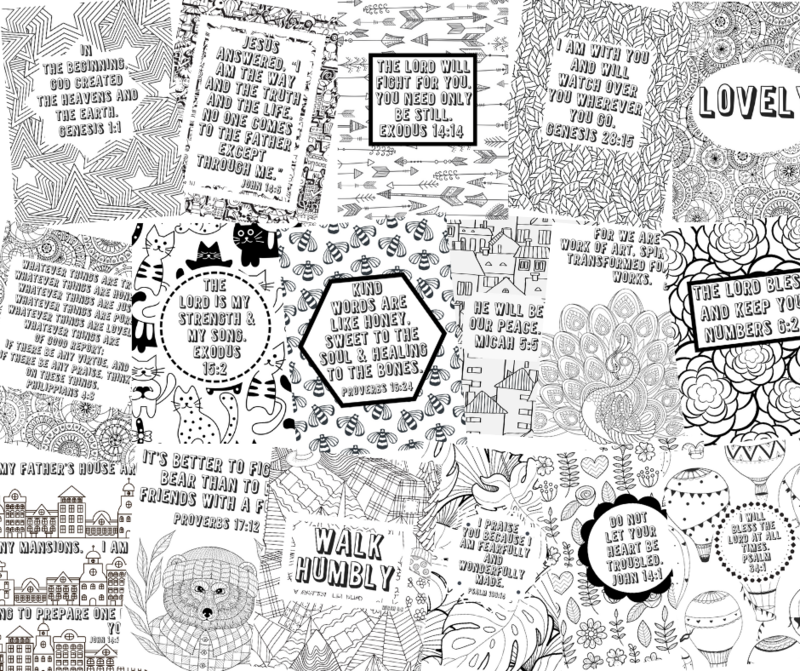 It also has two or more ideas for your scrapbook/prayer journal. Before this devotional, my family didn’t have a scrapbook/prayer journal, but it has been one of the best things we’ve started as a family. We ordered a Smashbook and we just stick in the answers to the prompts or let the kids draw directly in the book. It’s been fun to look back at the prayer requests that have been answered and to see our kid’s faith mature and grow. So if you do every single thing that’s available for the week, you’ll be able to go very deep on the study. But if your family is having a busy week, you can choose to do less but still get the basics in without feeling like you’re sacrificing. In conclusion, do a family devotional. And I know that is WAY easier said than done. But to have kids who are actively growing in their faith, they need parents who are pouring into them. We have to make the time to have daily conversations about Christ if we want to raise humans who think about God daily. But those things take up such a small percentage of our kid’s lives. Their home life has to be part of the formula of making them more like Jesus. We can’t outsource this to other people. Let’s raise kids who are used to talking about the Bible and thinking about the Bible instead of just hearing the Bible preached a couple of times a week. Let’s start by getting the best family devotional and committing to do it with our families at least once a week. If you’re unsure how to actually do a family devotional, check out our post: How to Do a Family Devotional. 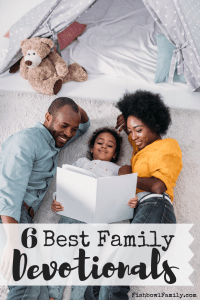 Which book do you think is the best family devotional? Did it make our list? Tell us in the comments!